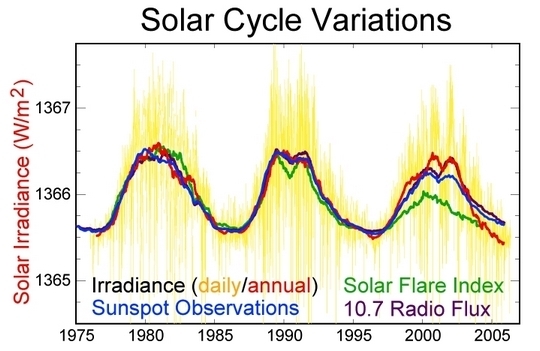 Total solar irradiance, or insolation, is shown on the recent graph Solar Variation. Can believing the earth is not a closed system hurl non-technical people down the forsaken path of anthropogenic global warming? Physics tells us that there are 3 types of systems: a closed system (cannot exchange matter, but can exchange heat), an isolated system (exchanges nothing), and an open system (exchanges everything). The earth, therefore, IS a closed system, because no matter is exchanged, but heat can be. If no matter can be exchanged, nitrogen, oxygen, carbon, and all other elements will remain in the same quantities for the millions of years earth exists. With a finite amount carbon and oxygen, there will always be a finite amount of CO2. As a result, both warming and cooling of the earth takes place, and is partially explained by this video on Solar Variation.